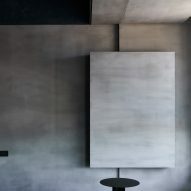 Concrete, clay and dark blue wallpaper line the walls and ceilings of this darkly atmospheric apartment in Taipei, Taiwan, designed by locally based studio Wei Yi International Design Associates. 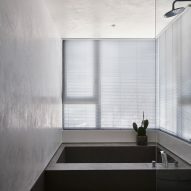 Measuring 270 square metres, the Blue Eye apartment is located in the city's Zhuwei neighbourhood with panoramic views of the Tamsui River to the west and Mount Datun to the north east. It also neighbours a protected wetlands reserve with a mangrove forest, and Guandu Bridge. 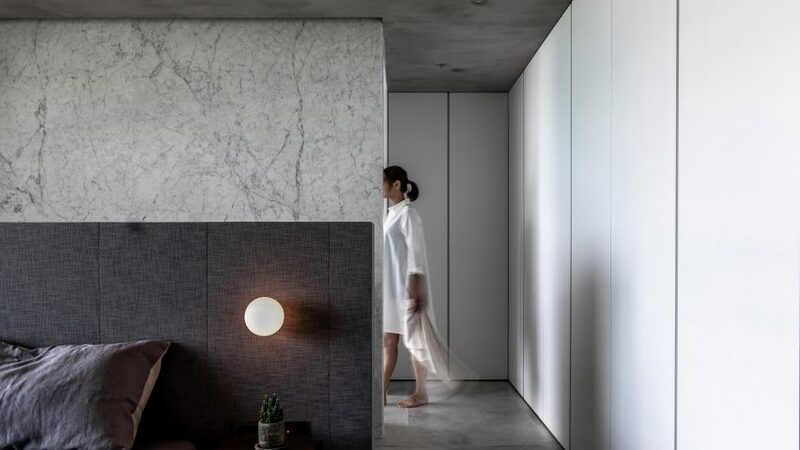 Wei Yi International Design Associates, which has studios in both Taipei and Shanghai, said that the design team channeled the apartment's surrounding topography when designing the apartment. 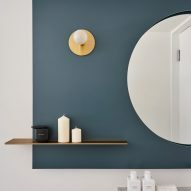 "The concept of Blue Eye originates from the ocean, where all things are nurtured," explained the designers. 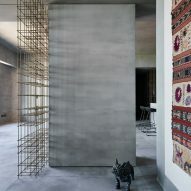 "The space reveals the mindset of the resident." 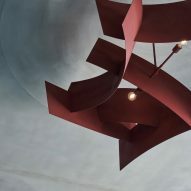 The textured surface of the curved and recessed concrete and clay walls throughout the space are intended to reference the serenity of the nearby wetlands, meanwhile the burgundy pendant lamp in the living area is a nod to the Guandu Bridge. 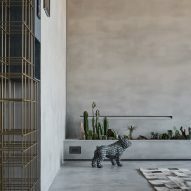 "The rustic characteristic of cement is used as the main feature for shaping the overall atmosphere, reflecting the resident's pursuit of serenity," said the design team, which also used a water-resistant moiré coating in the master bathroom. 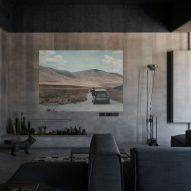 "The resident's mindset determines where he or she lives," said the studio. "The pursuit of tranquility as well as exploration and expectations of the future environment may serve as the best interpretation of a Blue Eye resident's state of mind." 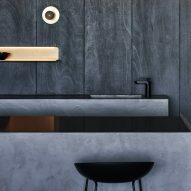 Warm-coloured metals and wood, such as brass and copper, serve as a warm counterbalance to the concrete used within the interior. 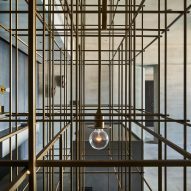 A series of floor-to-ceiling structures that provide storage space throughout the apartment are made from criss-crossing brass rods. "The visual changes created by the intertwining of structures give the user a magical feeling when he or she moves within the space," commented the designers. 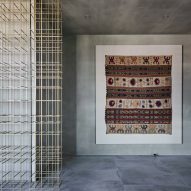 The owner's art collection is also displayed throughout the apartment, including wooden sculptures and a one-hundred-year-old hemp carpet from Uzbekistan that is displayed at the apartment's entrance. 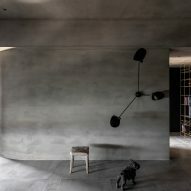 Previously, the Tapei-based studio has created an all-grey apartment in the city, which features concrete walls, cement floors, grey tiles, marble and dark stained wood. Photography is by Wei Yi International Design Associates.